Since I’ve been reading Ruth Riechl’s “Garlic and Sapphires,” I’m inspired to write about food this week. If you’ve never read anything by this former New York Times Restaurant critic/Gourmet editor, you must pick up one of her books immediately. She will make you want to EAT. New Year’s Resolution Dieters, you actually may want to wait until February to read her, once the diet has already gone awry. 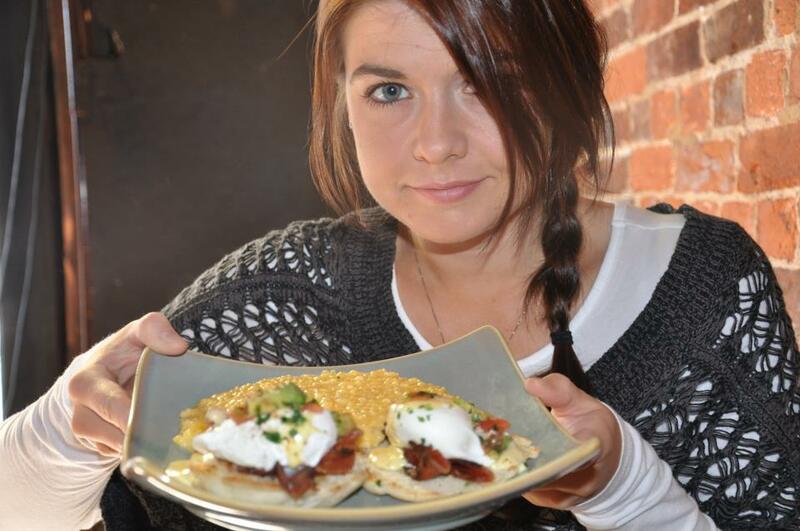 One of my top-ten all time favorite dishes is Eggs Benedict. Of all the countless places I’ve consumed Eggs Benedict, here are a few of the highs and lows. The Waterfront Hotel: Baltimore, MD: This has been my best Eggs Benedict restaurant experience to date. My friend’s cousin’s wife had recommended this brick Fells Point restaurant for brunch and it was fabulous. Instead of Canadian bacon (which I typically remove) between the poached egg and the English muffin, The Waterfront Hotel opted to go with regular bacon instead. This substitution had never occurred to me, but I’ve been ordering Eggs Benedict with regular bacon ever since. But it was the cheese grits that really made this dish. I’d had my first “cheese grits” at a Waffle House in Savannah a few weeks previously. Not surprisingly, The Waterfront Hotel’s were oh-just-a-bit better. Eggs Benedict is a dish meant to be consumed with cheese. My Parent’s House: Snohomish, WA: I used to hate eggs Benedict. That is because every Sunday my parents would make their far superior version of the dish, adorably named “Eggs Bennie.” Eggs Bennie featured the English muffin and poached eggs, but instead of hollandaise sauce, my mom would make a cheese sauce to pour over the top of the dish. I was the pickiest eater in the world during my adolescence, but I would eat just about anything as long as it was smothered in that cheese sauce. It took me a long time to appreciate real Eggs Benedict without that sauce. My brother is anti-egg and just has “Bennie” on Sunday afternoons: an English muffin and the sauce. 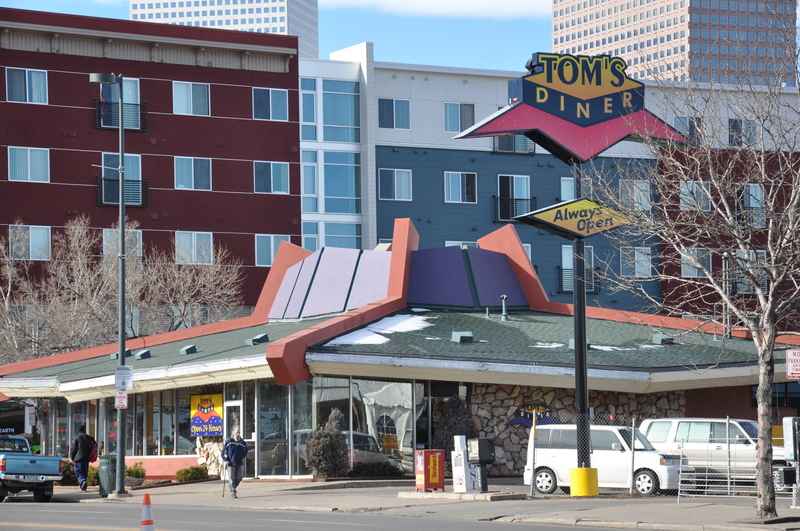 Late Night Eggs Benedict: Tom’s Diner in Denver, CO and Blueberry Hill in Las Vegas, NV: I like bad food. I’m seriously just as happy at Chili’s as I am at Jaleo in Washington D.C. (Okay, maybe that’s a bit of an exaggeration, but still). But the “Eggs Benedict” at Blueberry Hill is pretty bad, even by my *ahem* “late-night” standards. The hollandaise sauce is literally bright orange. I don’t know how this colorful feat is accomplished at three in the morning, but it is not good. On the other side of the mountains, Tom’s Diner in Denver has got things figured out. I was there last weekend after a concert at the Ogden (Me! At a concert! It was weird. I’m definitely going to have to step up my music appreciation skills here in Denver. My Taylor Swift and Jason Durillo fandom is just not going to cut it.) The fine people at Tom’s fulfilled my inebriated demands for “good bacon” and their sauce was an acceptable color of pale yellow. Success. Eggs Benedict on a Buffet Line: Mandalay Bay Buffet in Las Vegas, NV: When I lived in Las Vegas, I would usually opt for a breakfast buffet instead of a diner type place, (Guess how much weight that preference cost me?!?) but Eggs Benedict was usually a problem. Some chefs would try, but most understood that this dish was just not meant to sit under a heat lamp for longer than two minutes. Therefore, omelet stations were all the rage at buffets. I hate omelets unless they are equal parts egg and cheddar with lots of Nacho Cheesier Dorito crumbs thrown in at the last minute (don’t knock it ‘til you try it!). Chefs were exceedingly unwilling to add my favorite chip to their omelets, so I would boycott the egg section of buffet lines and stick to apple crumble, breakfast pizza and mimosas. Until we went to Mandalay Bay. This is an awesome buffet. If you go, be sure to get a seat overlooking the pool towards the back of the dining area. And don’t miss the desserts. They are way over on the other side of the restaurant. But the greatest thing about this buffet is that they have unadorned poached eggs resting atop bacon (the bad kind, but you can switch that out. The non-Canadian variety is bound to be around somewhere) and English muffins. The hollandaise sauce is sitting in its own little container and – this is the best part – you can put as much on as you want. Genius. For all you fellow benedict fans thinking about consuming this fabulous dish in New Zealand, check out “The Best Bene,” a whole blog of bene reviews down under.